Robyns Simple Life: Superman does Nascar??? 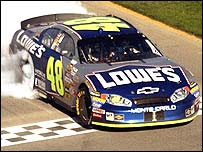 Yesterdays Nascar race at the Kansas Speedway was a photo finish sight to behold!. Unfortunately I slept through most of the race but did manage to catch the last 70 some odd laps and it was a hell of a day on that track.. Some where during the race Tony Stewarts car became Nascar lawn mower after he spun out onto the grass and literally mowed the grass with the front end of his car. I have no idea where "golden boy" Kyle Bush ended up except that, he was way back at the end of the pack. That boy has been having some severe issue's with his car the last 3 races and yesterday was no different. Earlier in the day on a local radio station the announcer has chosen Bush as one of their top picks to win in Kansas but by lap 174 Bush wasn't even a blip on the screen. Now I don't wish any of the drivers bad luck but Bush is getting a nice little smack down and just when it's needed.. He's been extremely cocky since the season began because he was dubbed as "unstoppable, unbeatable" strange though, how fate has a way of coming in and slapping you down. I'm thinking Mr. Bush is a getting a much needed dose of reality this past few weeks that he has a long way to go yet to be able to surpass the more experienced drivers of Nascar but, enough of that lets move onto the awesome finish. We are a half a lap down before crossing the finish and Johnson who I shall call Superman is leading but Carl Edwards who in himself is a force to be reckoned with on the track was right behind him and moving in. Johnson knew Edwards was there but figured he had it all locked up. Wrong.. Suddenly out of no where Edwards shoots out like a rocket! Passes Johnson on the bottom of the track and takes off but he over estimated his speed because the two drivers were coming into a turn and Johnson knew Edwards was never going to be able to make that turn at the speed he was at and sure enough Edwards slams into the wall and Superman (Johnson) fly's past Edwards just as if he put on his cape in a phone booth and was ready to leap tall buildings, crossing the finish line and clinching the win at Kansas! It was an awesome sight and that was what you call a Nascar Finish! Check it out here "Final Lap Johnson Holds On"
Kuddo's must be given to Carl Edwards who drove his guts out trying to keep up with Johnson and almost blew past him a few times. I also want to mention Jeff Gordon who happens to be Johnsons team mate. Gordon was very ill yesterday but put his heart into his driving yesterday like I haven't seen him do all season and ended up with a respectable 4th place top 5 finish. Way to go Jeff! But a HUGE congratulations to my boy Jimmie Johnson who took home the win once again.. Now it's off too Talladega next week!